Located in Brisbane Waterfront, this apartment building is within a 5-minute walk of Bluewater Square and Redcliffe Museum. Settlement Cove Lagoon and Bee Gees Way are also within 10 minutes. Located in Brisbane Waterfront, this luxury apartment building is within a 5-minute walk of Redcliffe Jetty Markets and Bee Gees Way. Bluewater Square and Redcliffe Showgrounds are also within 15 minutes. 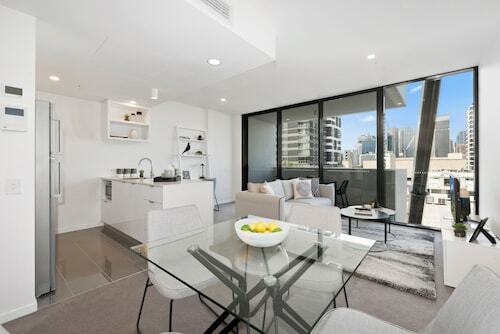 Located in Brisbane Waterfront, this luxury apartment building is within a 10-minute walk of Sutton's Beach, Bluewater Square, and Settlement Cove Lagoon. Redcliffe Museum and Bee Gees Way are also within 10 minutes. Set on the banks of Northern Moreton Bay, the Redcliffe Peninsula is a thriving little hub of old and new. Encompassing the city of Redcliffe and the tightknit suburbs of Woody Point, Margate, Scarborough, Kippa-Ring, Clontarf, Rothwell and Newport, Redcliffe Peninsula is most commonly referred to as simply Redcliffe. Touting seaside adventures along its shores, a buzzing local dining scene and a relaxed vibe that makes it the perfect holiday destination, wot more could you want? 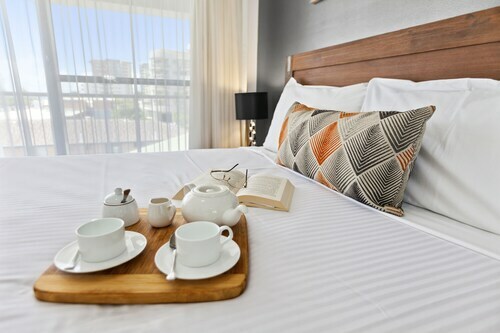 Book your Redcliffe accommodation with us today! Named by Matthew Flinders in 1799, the red cliff faces that stand out from the shores were his source of inspiration. Settled by Europeans in 1824, Redcliffe is Queensland’s first settlement city but was relocated to the banks of the Brisbane River the following year and left deserted. Years later in the 1860s, the area was declared an agricultural reserve before a land boom hit in the 1880s and its seaside location was again highly prized. Today, Redcliffe’s safe, sandy and sheltered beaches are still drawing in locals who love the chance to get away from the Brisbane city in exchange for a laid-back lifestyle just 40 minutes’ drive away. All across the peninsula, picnicking, boating, cycling, windsurfing and stacks of water activities await you! Fish and chips takeaway joints, cute cafes and nice restaurants line the water and the city heart. Also in the city centre, you’ll absolutely love the free Settlement Cove Lagoon and Sutton’s Beach – the only patrolled beach on the peninsula, complete with barbeque areas and playgrounds. Take a stroll out along the jetty, which comes alive on Sundays with the Redcliffe Jetty Markets. Browse stalls full of food, funky crafts, jewellery, fashion, plants, and all sorts of bric-a-brac that you probably don’t need but won’t be able to resist! At the northern end of the Peninsula, Scarborough Boat Harbour is a vibrant precinct that offers vehicular ferry services across to Moreton Island, the third-largest sand island in the world! Both here, and at the nearby Newport Marina, you will find a number of cruise, fishing, and scuba diving charters to chauffeur you out onto the water. All around the peninsula, the emphasis is on lifestyle. This is a great spot to holiday with kids! Within easy reach you can also take a day trip to the beautiful Sunshine Coast and Sunshine Coast Hinterlands, or the beautiful Glasshouse Mountains to the north. A really special time to visit Redcliffe is in May, when the weekend Kitefest showers the sky in colourful kites of all shapes and sizes, luring in kite enthusiasts from around the world. The warbird aerial displays, seafood and wine make sure the adults have something extra to enjoy. Come September and the Celebrate Redcliffe Festival goes off! Street parties, a sunset fiesta, superboat championships, amusement rides, and food and market stalls are all part of the free and jam-packed program. 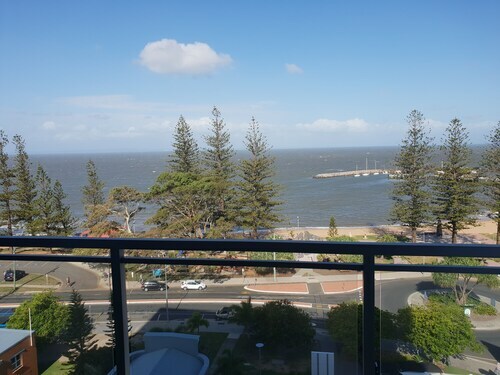 So, thinking about booking a stay in Redcliffe? Wot are you waiting for? Check out or range of Redcliffe Peninsula hotels and lock it in! 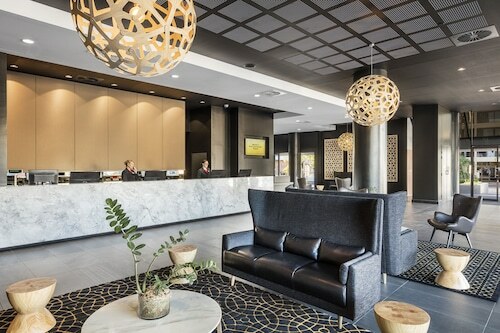 Hotels in Redcliffe start at AU$108 per night. Prices and availability subject to change. Additional terms may apply.